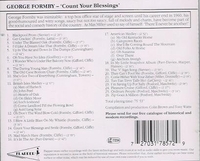 “George Formby was a British comedy actor, singer-songwriter, and comedian. He sang light, comical songs, accompanying himself on the banjo ukulele or banjolele. He was a major star of stage and screen in the 1930s and 1940s. 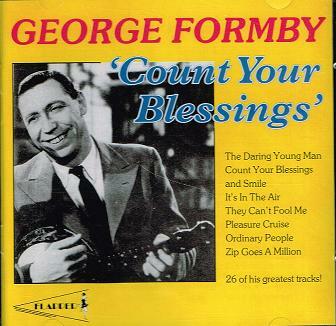 Formby endeared himself to his audiences with his cheeky Lancashire humour and folksy north of England persona. In film and on stage, he generally adopted the character of an honest, good-hearted but accident-prone innocent who used the phrases: ‘It's turned out nice again!’ as an opening line; "Ooh, mother!" when escaping from trouble; and a timid ‘Never touched me!’ after losing a fight of almost any description. What made him stand out, however, was his unique and often mimicked musical style. He sang comic songs, full of double entendre, to his own accompaniment on the banjolele, for which he developed a catchy and complicated musical syncopated style that became his trademark. His best-known song, ‘Leaning on a Lamp Post was written by Noel Gay. He recorded two more Noel Gay songs, ‘The Left-Hand Side of Egypt’ and ‘Who Are You A-Shoving Of?’ Over two hundred of the songs he performed, many of which were recorded, were written by Fred Cliff and Harry Gifford, either in collaboration or separately, and Formby was included in the credits of a number of them, including ‘When I'm Cleaning Windows’. Some of his songs were considered too rude for broadcasting. His 1937 song, ‘With my little stick of Blackpool Rock’ was banned by the BBC because of the suggestive lyrics. 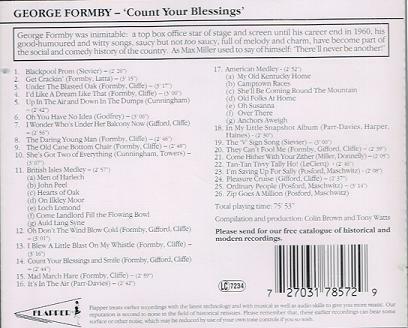 Formby's songs are rife with sly humour, as in ‘Mr Wu's a window cleaner now’ where Formby is about to sing ‘ladies' knickers’ and suddenly changes it to ‘ladies' garters’; and in 1940's ‘On the Wigan Boat Express’, in which a lady passenger ‘was feeling shocks in her signal box’. Formby's cheerful, innocent demeanour and nasal, high-pitched Lancashire accent neutralised the shock value of the lyrics; a more aggressive comedian like Max Miller would have delivered the same lyrics with a bawdy leer. George Formby had been making gramophone records as early as 1926; his first successful records came in 1932 with the Jack Hylton Band, and his first sound film BooTS! BOOTS! in 1934 (Formby had appeared in a sole silent film in 1915). The film was successful and he signed a contract to make a further 11 movies with Associated Talking Pictures, earning him a then-astronomical income of £100,000 (roughly USD 4 million in 2009 terms) per year, despite the fact that studio head Michael Balcon reportedly considered Formby ‘an odd and not particularly loveable character’. Between 1934 and 1945 Formby was the top comedian in British cinema, and at the height of his movie popularity (1939, when he was Britain's number-one film star of all genres), his film LET GEORGE DO IT was exported to America. Although his films always did well in Britain and Canada, they never caught on in the United States. Columbia Pictures hired him for a series, with a handsome contract worth £500,000, but decided not circulate his films in the US.